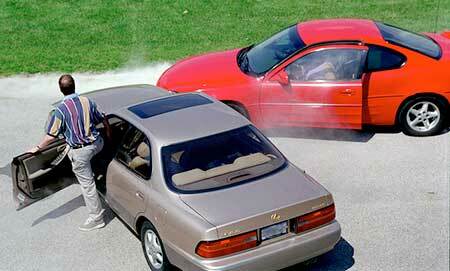 Sometimes, minor car accidents cause bothersome or even lasting injuries. After a fender bender, you might suffer bruising across your torso from your seat belt. If you are rear-ended, you might experience stiffness in your back, soreness in your neck, or a muscle sprain. A loud crash can trigger headaches. And all car accidents, regardless of how serious, may cause anxiety or insomnia. If you were in a minor car accident, you may be wondering whether you can make a claim for your injuries, including any pain and suffering that you experienced. The term “pain and suffering” refers to the physical and emotional stressed caused by an injury. There are two methods by which you can attempt to recover money to compensate you for your injuries and any associated pain and suffering after a car accident. The first is by making a claim with your insurance company, and the second is by filing a lawsuit against the other driver in a civil court. When it comes to injuries resulting from minor car accidents, there are pros and cons to each approach. You should always notify your insurance company after a car accident, but there are a few things you should keep in mind about insurance in Texas before making a claim for medical expenses and/or “pain and suffering” arising from injuries you sustained in a minor car accident. First of all, Texas is one of many states that uses a “fault” system when it comes to auto insurance. This means that drivers must pay for the accidents they cause. After a minor car accident, you are entitled to file a claim with your insurance provider as well as that of the other driver. But it is important to understand that the other driver’s insurance will cover the costs associated with your injuries only if you were not at fault in the accident. If it is determined that you were more than 51 percent at fault in the accident, you and/or your insurance company will be responsible for any medical bills you incurred as a result of the accident. This could affect your insurance rates or leave you with costly medical bills. That being said, filing an insurance claim for your medical expenses is generally a good approach if you are confident that you were not at fault in a minor car accident. Texas requires all drivers to carry a minimum of $30,000 in bodily injury liability insurance per accident, so as long as your injuries did not require extensive medical treatment, you will likely be repaid by the at-fault driver’s insurance company for any expenses you incurred. If you believe you are entitled to compensation for pain and suffering, you may be able to negotiate a settlement of your claim that takes into account the physical and emotional stress you suffered as a result of your injury. It should be noted that lying to an insurance company about pain and suffering in an effort to receive a higher settlement constitutes insurance fraud. In Texas, courts regularly award damages to injured parties for their pain and suffering. But in calculating the amount of money to which you are entitled, the court will consider a number of factors including the severity of the accident and your injuries. If you cannot back up your claim that your injuries caused pain and suffering, you may receive only nominal damages (or even no damages at all). You should also know that courts do not take kindly to those who waste judicial resources by bringing frivolous lawsuits or meritless claims. Thus, a lawsuit may not be your best option after a minor car accident. This is particularly true if both parties were insured as is required by Texas law and you can have your claims settled through insurance. If you have questions about whether you are entitled to compensation for pain and suffering, contact an experienced car accident lawyer. A lawyer can give you advice based on your situation, and may be able to guide you in the process of seeking compensation from an insurance company.